jobihike, "the four"; hišge, "really"; hinįkewehi, "each in turn"; honąkišik, "stockings"; howaihįbi, "to go in, to seek ahead, to accomplish"; waragigųs, "to touch"; waračga, "to guess at with the mouth"; waxopįna, "spirits"; woručga, "to guess at with the hand"; wočexihi, "precious". 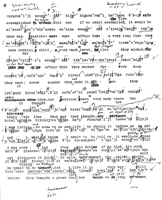 First Row "raw" interlinear text from Paul Radin, Notebook, Winnebago III, #1: 3-7. Second Row revised interlinear typescript from Paul Radin, Notebook, Winnebago II, #5: 5-9.
rusgičšé. Ánąga égi nąjokíją wašikjanégi. he tied. And then pity he was going to ask from them. every day whose breath is thrown upon us, they were to pass them, they were. *at the top of the page, Radin has written, "hipirak = belt" and "wa — snow". †this word is put in parentheses by Radin, which seems to suggest that it was inserted for clarification, but there is no indication of this in the original MS text. ‡the letter /o/ is inserted with a caret above the line. ‡‡typed in above the line and inserted in place by a line and a caret. *in Winnebago III, #1: 4, the words hą́bamanína sgá[ɕ´] sądjañ[ɕ´] are underlined. †the revised typewritten text of Winnebago II, #5: 6, has only sgáxdjį́ją in place of sgáxdjį́ sądjąxdjį́ją. ‡the text of Winnebago II, #5: 6, has "the earthmaker". *the accent over the /e/ was crossed out. 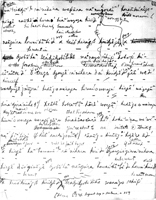 *the corrected text has sagipirágeją, but the original text's form, sagipirágiją, is attested elsewhere (presumably from sagipirák-iją). *omitted in Winnebago III, #1: 4.
žegų́ hogiwéže. Jobóhą, nągúra howaihįbíže. *this word has a line drawn under it. Just below this line and above the typed English translation, it reads "had gone". A line extends down from the /e/ in this phrase to the bottom of the page where it is written, "seeking ahead) accomplished" [sic]. *inserted after this word with a large caret and a line to the top of the page, is a bracketed text of two sets of interlinear lines. It is not found in the typescript. *this concludes the inserted passage. *the translation given in the MS text. The typescript has "Hoho". *this is jesgá, and not jésge égi (from [λ] [α´]) as the typescript has it. In the English line, there is only one dash (indicating no translation given) rather than two; the letter is /a/ and not the very pronounced α that Radin uses; the letter is accented, whereas no instance of α is ever accented; and the translation, "so then he returned," does not match the set up of the initial clause. *the corrected typescript text has "Wacdjįgédjinįgera" in error. †Radin has "your uncles, your aunts" switched from their proper order in the translation. *one might expect to see wąkcik xede, or wąkcikede from sandhi, but this form is attested elsewhere. Its literal meaning is "great men", but in the original MS, it is translated as "old men". *the word means "rite, religion". howakíriže. Égi či hokiságeja kirijéže. he went around. And lodge in the middle he came back. *after this word, there is a very large caret with a faint line leading back up to the top of the page to the same text inserted above. However, at various places there are lines striking this connection out. There is another line leading up the left side of the page to the same text. On the repetition of this part of the text, see below. *the revised typescript says, "without stockings". At the bottom of the page Radin writes, "honąkícik = mocassin without stocking". The word nisge means, "like, sort of, kind of, as". *the corrected typescript text has only nąkéhura. †this concludes the inserted passage. At the bottom of the page is written, "[9/7/'48. Repeat top 2 sentences. = 259". *instead of "and", Radin has, "he did". *handwritten and inserted above the line with a caret in the typewritten text. *the corrected text of the typescript has incorrectly, hisį́sintcce. †the corrected text has jesgé. *contrary to the original MS, the typescript has, hak’íradje. not he will not fail to obtain it," he said. Source: The original interlinear is found in Jasper Blowsnake, Jasper Blowsnake's Account of the Medicine Rite, in Paul Radin, Winnebago Notebooks (Philadelphia: American Philosophical Society, n.d.) Winnebago III, #1: 3-7. The corrected text is a typescript in Jasper Blowsnake, Jasper Blowsnake's Account of the Medicine Rite, in Paul Radin, Winnebago Notebooks (Philadelphia: American Philosophical Society, n.d.) Winnebago II, #5: 5-9. For a loose English translation, see Paul Radin, The Road of Life and Death: A Ritual Drama of the American Indians. Bollingen Series V (Princeton: Princeton University Press, 1973 ) 82-84.